Home › Knowledge Hub › Case studies › How did a patient appeal become a global feel-good story? Kate Robertson was travelling in Burma when she heard the news that her fiancé, Mike Brandon, 29, who was back home in Bristol, had been diagnosed with leukaemia and needed a lifesaving stem cell transplant. She rushed home and contacted Anthony Nolan’s communications team with their idea to launch a campaign to search for a donor. The challenge was to create a shareable campaign with mass media appeal encompassing traditional press, broadcast and social as well as maximise links in the Bristol community and beyond. The ultimate aim was to encourage more males aged 16-30 to sign up to the Anthony Nolan register. 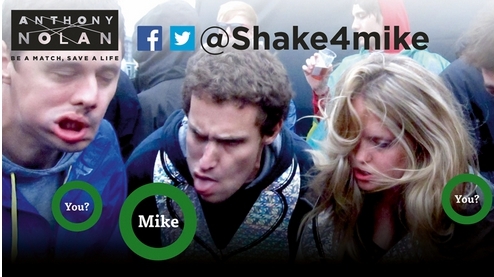 Kate, Mike and their friends came up with a brilliant concept this age group could relate to: Shake4Mike. Shake4mike encouraged people to register at anthonynolan.org, shake their face at cancer while taking a selfie, share the image and the Anthony Nolan URL on social media and nominate others to do the same. Register. Shake. Share. Nominate. A patient appeal this big required a coordinated approach between Kate, Kirstin Wright (Kate’s friend who works in PR) and the press, digital and register development teams at Anthony Nolan. It also needed be executed quickly. Mike needed to find a donor by the end of June, giving him only two months to find a match. Just three weeks later the wonderful news was announced that a matching donor for Mike had been found and he would have his transplant the following month. Anthony Nolan worked with Kirstin to issue a national news story: “60 days to save a love story”. We sustained momentum by keeping media informed of the campaign’s progress, with news of the 650% increase in donor sign ups, and then the incredible moment the Anthony Nolan register had found a stem cell match for Mike. The ‘shakyface’ concept provided media with a quirky hook beyond the angle of a young couple searching for a donor. The results were unprecedented and there was a phenomenal demand for interviews with Kate. Due to her commitments caring for Mike time for media was limited. In the case of Kate being unavailable for press, quotes were provided to the appropriate media outlet. The majority of register applications come via a form on the Anthony Nolan website, making the online element of this campaign very important. The campaign was launched on social media to coincide with the news story. Kate and the Shake4Mike team created a Facebook page and Twitter account. The social media campaign was personal to both Kate and Mike and enabled members of the public to show their support and pass the message on. The digital angle also worked well as a hook for more traditional media coverage. Anthony Nolan kept the momentum going by asking staff to join in and highlighted the resulting pictures on social media and the website. To enhance the campaign, Anthony Nolan created a dedicated landing page. The key call-to-action was to join the register, but the page also had information for people who are outside the register’s age limit, asking them to donate online or spread the word to friends and family using the #shake4mike hashtag. The page was used to keep the campaign up to date. Visitors to the page spent more than double the average time spent on the rest of the website. The Shake4Mike team secured a spot at a Tottenham Hotspur match where Anthony Nolan staff and volunteers signed up fans on-the-spot at the final home game of the season. Our register development team worked in partnership with Mike’s amazing friends to facilitate this at short notice and the press team secured the support of Tottenham media to promote it with a double page spread in the match programme. On behalf of Anthony Nolan, Kirstin also negotiated a free partnership with Tesco’s blinkbox Music –spreading awareness across the service’s one million users by hosting a 30 second advert. In just one month, the Shake4mike campaign achieved a combined circulation reach of 160.6million. An organic celebrity following began to build including Stephen Fry, Coldplay and Gary Lineker. We were even painted by cult hero Jim’ll Paint It! The Daily Mail article was the most successful referring link, with an astonishing 18% conversion rate for people clicking through and applying to join the register. Over 2,000 people joined the register as a direct result of this one article. We had over 9,000 donor registrations on our website during the period of the campaign. In the week following the initial news story we saw a 650% increase compared to the same week the previous year. The site also saw 4,120 visitors from Bristol in May compared to 165 the previous year. And finally, nearly £11,000 was raised because of the Shake4mike campaign. Shake4mike tells a story of a race against time, and above all, one woman’s dedication to the man she loves. As a result, media interest in the story was phenomenal. National media particularly embraced the role social media played in this ‘love story for modern times’. The impact of Shake4Mike has been unprecedented: it's inspiring to see a campaign make such a difference to the lives of so many.